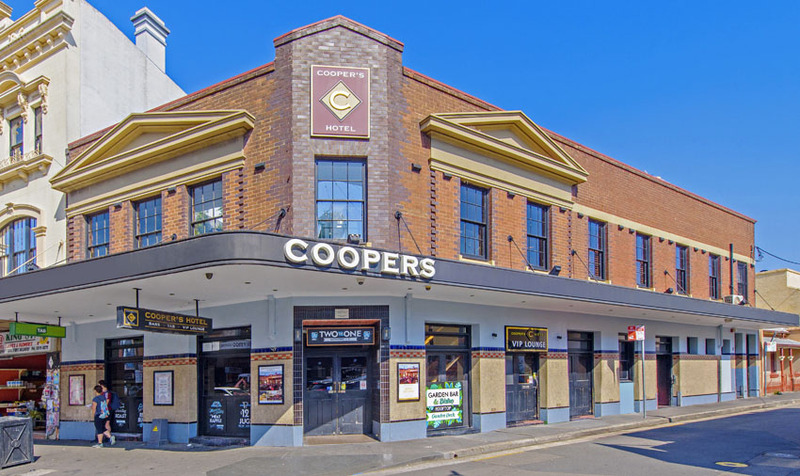 Newtown stalwart the Coopers Hotel has sold to new entrants to the sector, with Matt Williams’ King Tide group taking on their first pub for around $13.5 million. Strategically located at the northern end of King Street, just a few blocks from Solotel’s thumping Marlborough Hotel, the owner-operated Coopers proudly promotes its provenance in the increasingly capitalised Newtown precinct. It boasts a first level beer garden unique to the area, and expansive popular bistro. Gaming comprises 21 machines, with recent approval for an improved gaming offering. FY18 saw revenues across the business of $4.7 million, and while the agents declined to comment on the sale price, the $13.5 million reported in The Australian and AFR represents a yield below nine per cent. King Tide Hospitality Group is headed up by Matt Williams, son of Geoff Williams, long-time owner of Ashfield’s Crocodile Farm Hotel. Matt is also proprietor of uber-trendy new restaurant, Pacific Club Bondi Beach. The younger Williams’ entry to pubs comes courtesy of an off-market campaign through HTL Property’s Daniel Dragicevich and Sam Handy. “[They] will no doubt immediately seek to execute a strategic capital improvement program, and given their successful pedigree across food, beverage and gaming functions, we look forward to watching the future proposition take shape in concert with the surrounding precinct,” says Handy. Newtown and its immediate surrounds have become the new entertainment precinct of Sydney, drawing tens of thousands of visitors each Saturday night, to hip hangouts by the likes of Merivale, Fraser Short and Scott Leach, and Solotel. As the first significant sale of the year, Coopers resumes a strong performance in the market to the end of 2018, with HTL reporting 20 transactions totalling over $300m since its inception mid-year. The agents speak of a mix of established groups and well-capitalised newcomers driving steadily increasing valuations, bolstered by strong sector conditions and continued availability of attractively priced debt. “The Redcape float was a successful $1bn listing in the hotel space, and accordingly in our view, there can be no greater warrant regarding the sustained strength and longevity for the asset class,” suggests HTL Property Asia-Pacific managing director, Andrew Jolliffe. The results have not been limited to the cities, the company reporting strong demand for A-grade regional properties, which comprised half of its 2018 transactions.